I've done nail art designs that I am not so proud of mainly because I didn't get the results that I expected. This is one of those. More on that later. I have been wanting to create a night scene inspired nail art for quite a long time and finally decided to do one. I figured it was one design that I "needed" to do because I consider myself a nocturnal person. I am most productive at night. If I had my way, I will always do nail art in the evening or should I say, in the wee hours of the morning? The idea was simple. 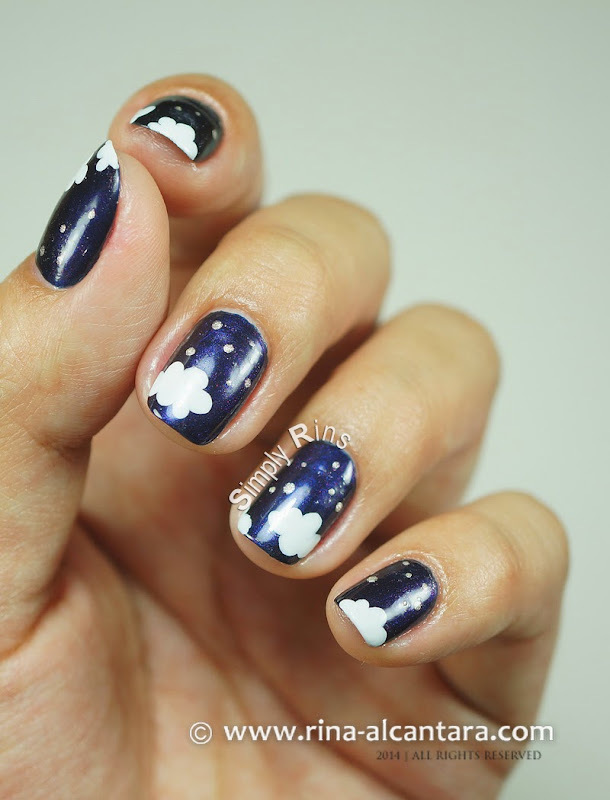 Dark blue background, gray clouds, and some sparkling stars. Well, you might have noticed by now that my so-called stars are not so shiny. I was deliberating whether to use glitter polish or using the micro beads. I now believe that the latter would have made this nail art a little more interesting. Next time? I used OPI Russian Navy for the base color. It's one of my favorite night blues. It looks more purple in the bottle but polishes a vampy blue on the nails. The nail design is freehand with acrylic paints and a dotting tool. Maybe I should have painted smaller clouds? Maybe I should have used actual glitters for the stars? Maybe I should have used a darker gray for the clouds? I now have more reasons to recreate this manicure. I am listing it down as I write this. This reminds me that I've done a paisley inspired nail art twice already and on both times, I really didn't like it so I chose not to post it here. It has been on my bucket list like forever and I can't seem to come up with one that I would be proud of. I'll probably give that another go one of these days. Have you ever had something like this happen to you? Anyone else nocturnal like me reading this post? Send me a shout out in the comment section. I love that youre posting more now :) have missed u. The design looks great. Hi Rins! Beautiful mani as usual. 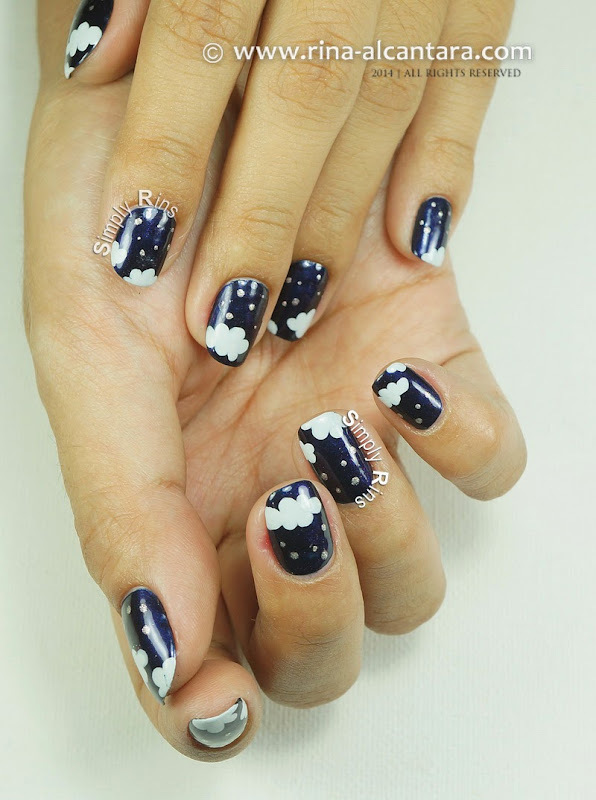 I'm thinking that the midnight blue you used has some shimmer to it that might have added to the lack of the "stars" effect you're looking for? Hello fellow nocturnal person! :p glitter nail polish for the stars, ive seen it used for a lot of galaxy/star nails. This design is to cute. 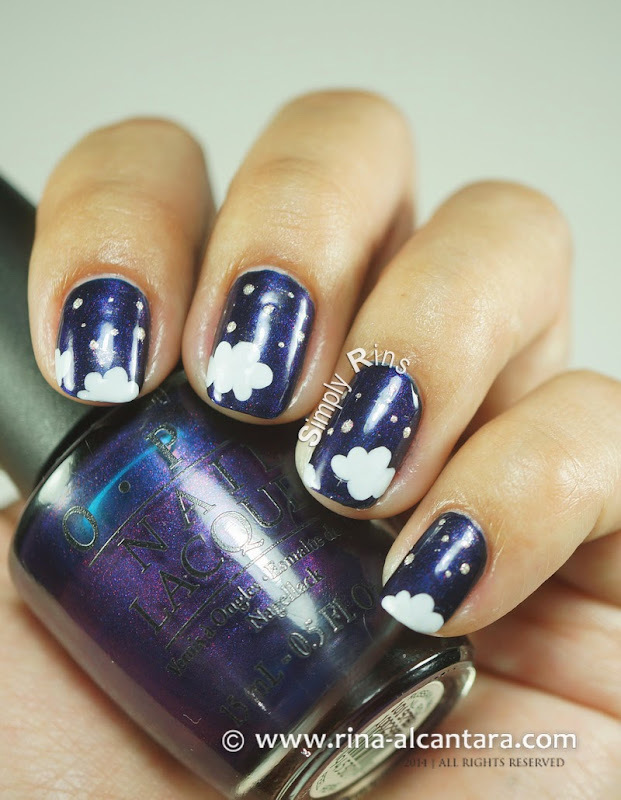 The contrast between the polishes are great and eye catching!